Dual paper trays hold letter or legal size paper. 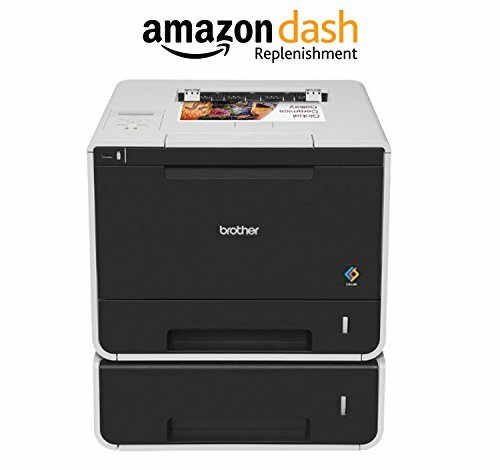 High-impact color printing and generous paper capacity for your small business or workgroup. 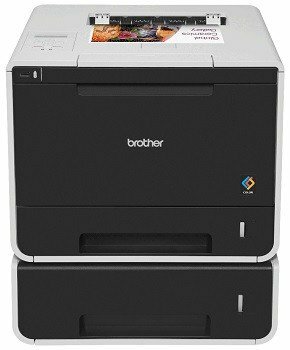 Connect the Brother HL-L8350CDWT to your wireless or wired network to provide your entire workgroup with fast, reliable printing of high-impact color documents. 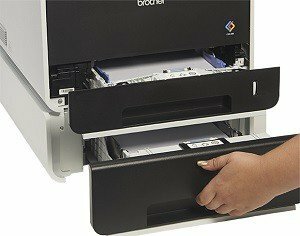 It includes business-friendly features to help keep printing costs in line, wireless and wired networking, and automatic duplex (two-sided) printing, It includes dual paper trays (250-sheet and 500-sheet capacity), so you can simultaneously store two different sizes of paper. There’s also a 50-sheet capacity multi-purpose tray for envelopes and thicker media, for a generous 800-sheet total capacity that can help reduce time-consuming paper refills. High-yield replacement toner cartridges1 (TN-336 BK/C/M/Y) print approximately 4,000 pages2 black and 3,500 pages2 color to help reduce printing costs. Secure Function Lock limits accessibility to selected functionality on a per user or group basis (for up to 100 users) to help reduce unnecessary use as well as paper and toner consumption. Two-sided (duplex) printing automatically produces two-sided color documents to help save paper. N-in-1 printing to help reduce paper and toner usage by combining multiple pages onto one page. ENERGY STAR Qualified with Deep Sleep Mode that uses less than one watt of power when not in use. Toner Save Mode for printing your less critical business documents. It’s easy to install the HL-L8350CDWT on a wireless network or on a wired network via Ethernet, or connect locally to a single computer via Hi-Speed USB 2.0 connection (cable not included). Plus, the USB Direct Interface on the front of the unit provides convenient walk-up printing directly from your USB flash memory drive4. And for organizations concerned with security, the HL-L8350CDWT offers several advanced security features including: Secure Print, Secure Function Lock, SSL, Enterprise Security (802.1x) and more. Your entire workgroup as well as visitors to your office will appreciate the convenience of printing wirelessly5 from a compatible Apple iOS, Android, Kindle Fire, or Windows Phone mobile device. Print via AirPrint, Google Cloud Print, the Brother iPrint&Scan app, Wi-Fi Direct, or Cortado Workplace. 2. Based on yields in accordance with ISO/IEC 19798 (letter/A4). 3. When comparing high-yield TN-336 C/M/Y cartridges vs. standard-yield TN-331 C/M/Y cartridge yields. 4. USB drive sold separately. Print JPEG, PDF, and XPS files. 5. Requires connection to a wireless network.